Iraq's most influential Shiite cleric gave his tacit endorsement to the new interim government Thursday, and urged it to lobby the U.N. Security Council for full sovereignty to erase "all traces" of the American-run occupation. Fighting broke out in Kufa between U.S. soldiers and Shiite militiamen — the eighth straight day of clashes since a deal last week to end the violence. Grand Ayatollah Ali al-Husseini al-Sistani did say that the new government, appointed Tuesday by a U.N. envoy, lacks the "legitimacy of elections" and does not represent "in an acceptable manner all segments of Iraqi society and political forces." "Nevertheless, it is hoped that this government will prove its efficiency and integrity and show resolve to carry out the enormous tasks that rest on its shoulders," al-Sistani said in a statement released by his office here. Six Iraqis were killed and 11 injured in the skirmishes in Kufa, stronghold of radical cleric Muqtada al-Sadr, hospital officials said. Smoke rose over the dun-colored, flat-roofed houses of the city 100 miles south of Baghdad. Several mortars were fired Thursday at the Italian Embassy in Baghdad, causing some Iraqi deaths, the Foreign Ministry in Rome said. No Italians were hurt in the attack, it said. The ministry said it did not have details on the number of Iraqis killed or their identities. Unconfirmed reports said two Iraqis died, the ANSA news agency said. The embassy attack is the second incident in a day where Italians were the target, as President Bush heads to Rome amid tension in Europe over the war. A video of three Italian hostages kidnapped in Iraq emerged Wednesday. In the multiethnic city of Kirkuk, masked men attempted to gun down Irfan Kirkukli, the province's deputy governor, in an ambush on his convoy as he drove to his office, said Maj. Gen. Anwar Mohammed Amin, commander of the Iraqi Civil Defense Corps. FBI counter-intelligence agents are focusing on the highest levels of the Pentagon in their search for who told former Iraqi ally Ahmad Chalabi one of the nation's best kept secrets — only to see Chalabi turn right around and share it with Iranian intelligence agents, reports CBS News Correspondent Jim Stewart. Mr. Bush has consulted an outside lawyer in case he needs to retain him in the grand jury investigation of who leaked the name of a covert CIA operative last year, the White House said Wednesday. The operative is the wife of a U.S. diplomat who revealed a flaw in the administration's case for war shortly before the name was leaked. While the U.S. ambassador said a revised U.N. resolution on transferring sovereignty to Iraq's interim government only needs "fine-tuning," key Security Council members including France, Russia and China insisted on major changes. The United States and Britain have submitted a resolution to the Security Council laying down a blueprint for the transfer of sovereignty and seeking international endorsement. It does not spell out the interim government's sovereignty. Many key council members have said they want the resolution to fully detail the new government's power. Iraqi Foreign Minister Hoshyar Zebari was in New York with instructions from the new interim government to discuss the text with the 15 members. He was scheduled to brief the council at an open meeting on Thursday afternoon. 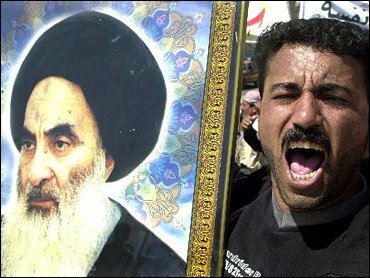 Al-Sistani's opposition to the government would have severely undermined its credibility because of the cleric's influence among Iraq's Shiite majority, believed to comprise about 60 percent of the country's 25 million people. Al-Sistani's objections to U.S. policy in Iraq effectively derailed at least two blueprints put forward by Washington to chart the political future of Iraq. He had demanded elections to choose the government to take power from the U.S.-run occupation at the end of this month but dropped his insistence after U.N. envoy Lakhdar Brahimi decided that an early ballot was not possible because of poor security. Iraqis will choose a transitional government by the end of January and elect a new administration after ratification of the new constitution next year. With the new government set to take over in weeks, al-Sistani said the main tasks were to secure Iraq's sovereignty, relieve the suffering of its people, restore security and prepare for the January elections. "The new government should get a clear resolution from the U.N. Security Council restoring sovereignty to Iraqis — a full and complete sovereignty in all its political, economic, military and security forms and endeavor to erase all traces of the occupation," al-Sistani's statement said. The fighting in Najaf and Kufa have raised fears of splits in the majority Shiite community, which aspires to political power in Iraq after the U.S. occupation ends June 30. Senior Shiite clerics oppose al-Sadr but have refrained from trying to silence him for fear of worsening communal splits and losing influence at a time when the young firebrand's anti-U.S. rhetoric is finding greater resonance among Iraqis. The uprising began two months ago after the U.S.-led coalition closed al-Sadr's newspaper, arrested a top aide and announced an arrest warrant charging him with murder in the April 2003 death of a moderate cleric in Najaf. Fighting has rocked Kufa nearly every day since Shiite leaders announced May 27 that al-Sadr had agreed on a formula to end the confrontation with the Americans in Najaf and Kufa, which together contain some of the most sacred shrines in Shia Islam. Although Najaf is relatively quiet, daily clashes in Kufa have rendered the truce almost meaningless. The Americans, who consider al-Sadr a gangster, have refused direct negotiations with him but have agreed to halt "offensive operations." However, the U.S. Army has retained the right to mount armed patrols, which al-Sadr's militia, the al-Mahdi Army, considers a provocation. The Americans are reluctant to stop patrols until an Iraqi force is ready to assume security responsibility, but most of the police here deserted after al-Sadr launched his rebellion in early April.